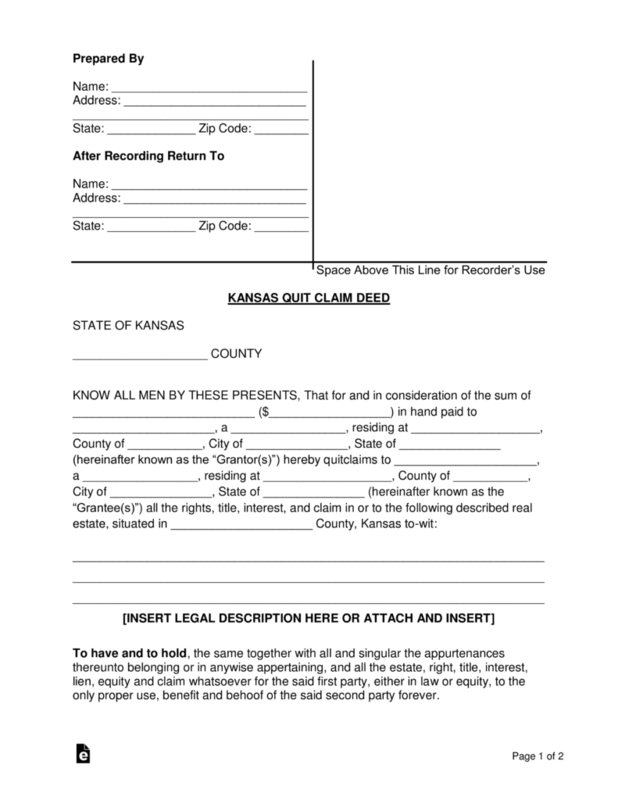 The Kansas quitclaim deed is a legal document used to convey real estate in Kansas. This type of deed grants whatever rights to the property the seller (or grantor) has in the property, but does not guarantee those rights. That means if there are other claims against the property, the buyer cannot make a claim against the seller or have any recourse against seller. These types of deeds are typically used for transfers between family members or from a person into a trust document. However, in order to be sure of the exact rights transferred, it makes sense to complete a title search to see if there are any undisclosed interests in the property. Recording – A quitclaim deed must be filed with the County Recorder’s Office where the real estate is located. Go to your County Website to locate the office nearest you. Signing (§ 58-2205) – A quitclaim deed is required to be authorized with a notary public present. Step 1 – The top of this page will require some preliminary information required for the Kansas Recorder of Deeds’ purposes. First, the Preparer must supply his or her Full Name and Address. There will be a blank line bearing the designation for each component: Name, Address, State, and Zip Code. Supply these items on the appropriately labeled lines. Step 4 – Locate the second line of the paragraph starting with the term “Know All Men By These Presents.” Here, will be two blank spaces separated by a “$” sign. As when writing a check, write out the full dollar amount before the “$” sign then fill it in numerically after the “$” sign. Step 6 – The next blank space will require the Grantor’s Street Address to be reported. The Building Number, Street, and Unit Number of this residence should be entered on the blank space just after the phrase “residing at.” The next three blank spaces require the Grantor’s County, City, and State to be entered, respectively, in that order. Step 7 – The next area of this paragraph will need to document the Grantee of this Property. To begin this process, locate the term “hereby quitclaims to” then enter the Full Name of the Grantee. This should be followed by designating this individual to the role by writing in the word “Grantee” on the next available space. Step 9 – The final blank space must have the County where the Property is located geographically reported. Below this will be three blank lines above the words “Insert Legal Description Here Or Attach And Insert” where the Legal Description of the Property must be reported. This should include such items as the Address of the Property and the Legal Description on the Deed or in the record books with the County Recorder of Deeds. Step 10 – The next area will describe the conditions of the template form being signed. This must be read and understood by all parties involved. The Grantor must then provide the binding effect for this document by Signing his or her Name on the “Grantor’s Signature” line. The Grantor must also Print/Type his or her Name on the “Grantor’s Name” line. Finally, the Grantor must provide his or her Address by entering the Building Number, Street, and Unit Number on the “Address” line and the City, State, and Zip Code on the “City, State & Zip” line. Step 11 – The closing area is designated purely for the use of the Notary Public’s notarization of this document. Only the attending Notary Public may fill in the County, Names of the Parties Present, and Date of the Grantor Signing. Similarly, only the Notary Public may provide his or her ID Number, Commission Expiration Date, and Notary Seal. 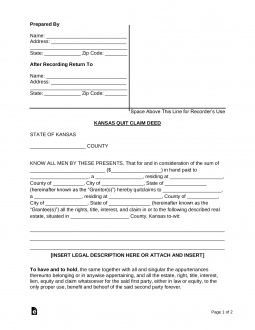 Step 12 – Once the information on the Kansas Quit Claim Deed has been verified and finalized, you may file it with the Kansas Register of Deeds Office of the County where the Property is physically found. Kansas has multiple counties, each one with its own Guidelines and Fees. Make sure to contact this governing entity directly before submitting this paperwork to remain in compliance with its expectations.